Deck the Hall with Santa’s helpers! This release is all about holidays and festivity! Its a Christmas release. YAY! I love Christmas releases and this one is absolutely gorgeous. I am sure by the end of the sneak peeks you have a very long to buy list. 🙂 Today I am previewing two stamp sets and coordinating dies. The first stamp set is called Deck the Halls. This set has coordinating dies. Adorable images of critters with baubles, tinsels and Christmas lights. 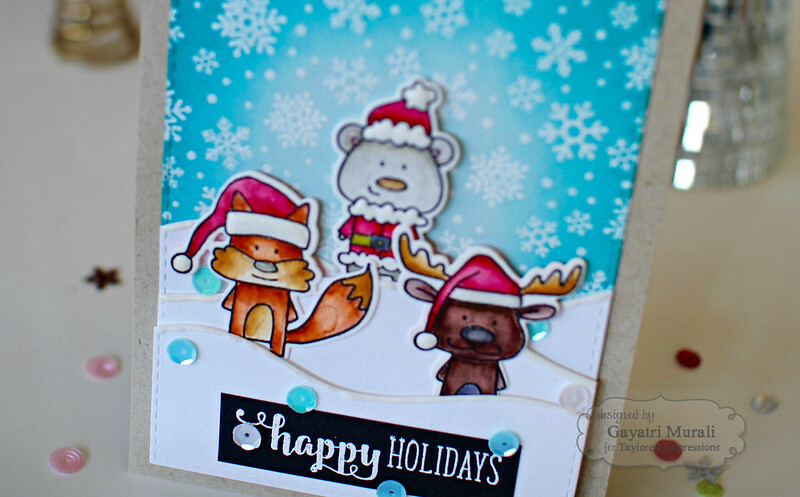 Here are couple cards I made using the Deck the Halls stamp set and dies. I stamped, copic coloured and die cut the deer image from the stamp set. This is my focal point. 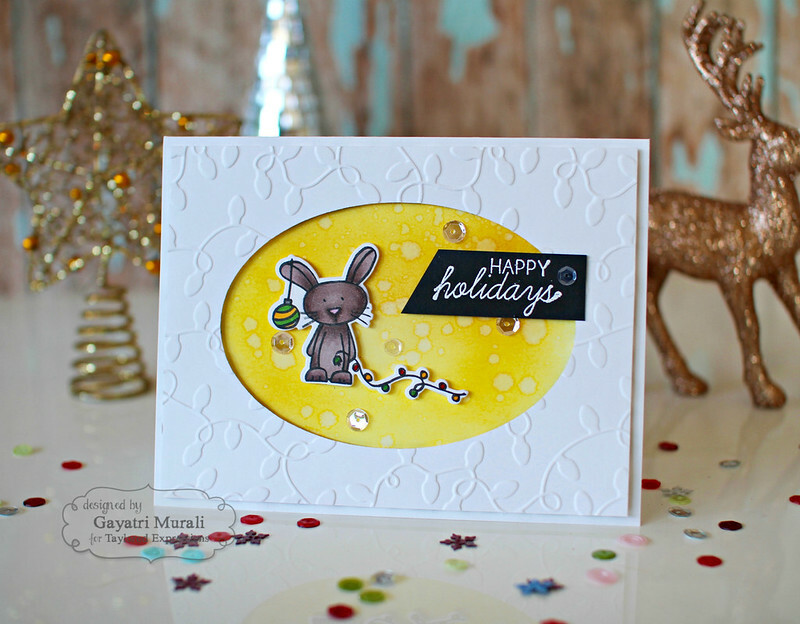 I embossed a white panel using the new Twinkling Holiday embossing folder which I adhered on the card front. Then I die cut the red diagonal striped pattern paper from the new Playful Pattern – Holiday 6×6 pattern paper pack using the second largest Stitched Oval die from Stitched Oval Stacklets. I adhered this panel on the card front using foam adhesives. I then adhered the deer on the centre of the oval die cut using foam adhesive. The sentiment I stamped and white heat embossed on Oreo cardstock strip and adhered using foam adhesives. I added glossy accent on the lights and bauble for added dimension. Simple and great to mass reproduce. Here is a closeup. I also made another card using similar method with slight change. The front panel is embossed using Twinkling Holiday embossing folder and I sponged the inside with Mustard Seed distress ink and spattered with clean water. On this card I embellished with TE sequins. Hope you like my cards. For more cards using this stamp set, check out Taylored Expressions gallery on Thursday. I have listed all the supplies used to make these cards below. 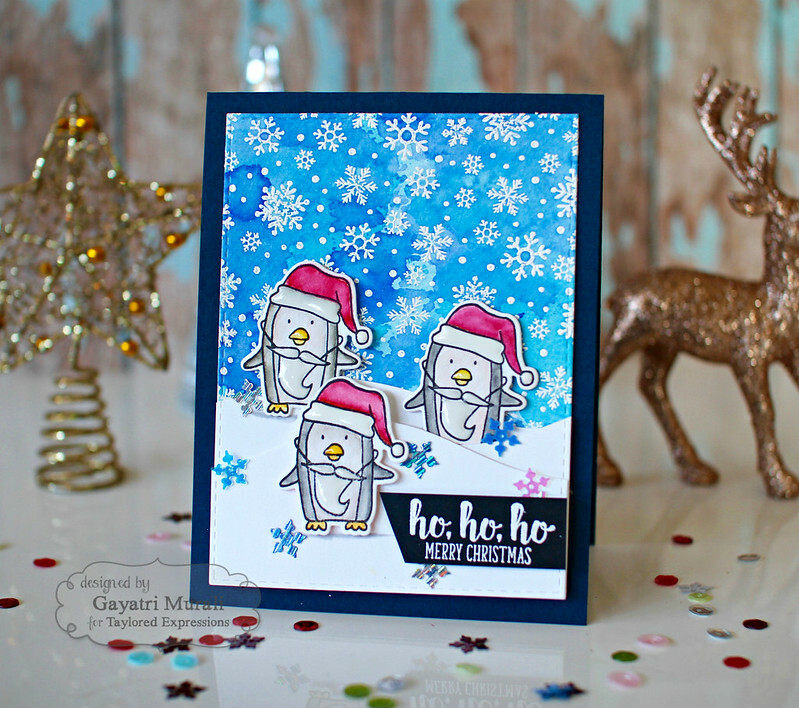 Next set I am showcasing today is called Santa’s Helpers and coordinating dies. Another adorable Christmas critter set. I also love the sentiment on this set. Coordinating die are very handy. Again I made a few cards. I will share a couple here. I stamped the images on watercolour paper and coloured them with Zig clean brush markers. Then used the coordinating dies to cut them out. For the background, I stamped and white heat embossed the Snowy Days background stamp on white stitched rectangle panel die cut using the largest of the die from Stitched Rectangle Stacklet. Then I sponged the panel using Cracked Pistachio and Evergreen Bough distress inks leaving the centre white to give that glow effect. I die cut three snow mounds using Build a Scene: Rolling Hills die.I adhered them on the panel using glue and foam adhesive to give dimension. Then I tucked in the critters on the snow mounds. The sentiment I simply white heat embossed on Oreo cardstock strip and adhered as shown. Finally embellished with TE sequins. The whole panel is adhered on Toffee card base. I applied liquid applique on the hats and top of snow mounds. Here is another card similar to this one. 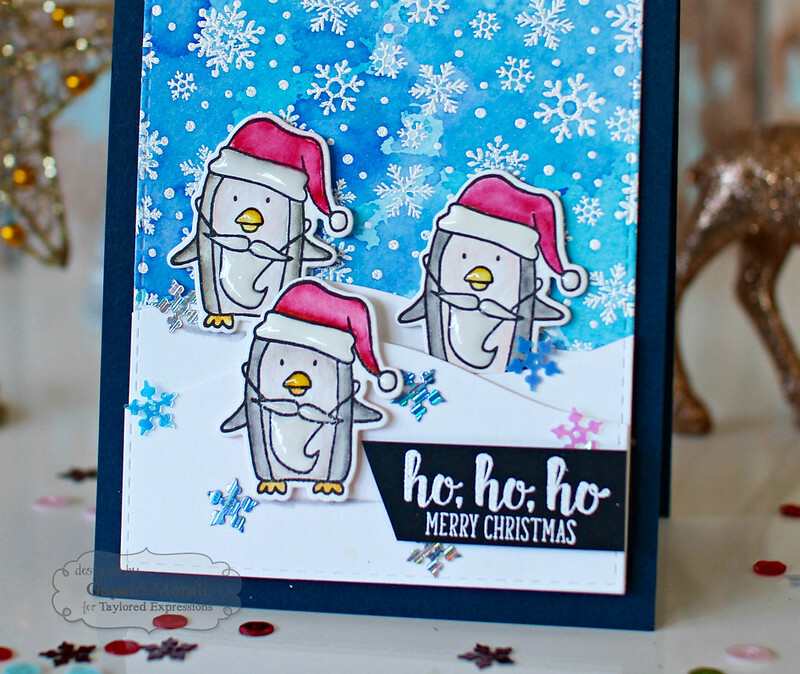 The background is watercoloured instead of sponging, used only the penguin images and Blue Corn card base. On this card, I applied the liquid applique without heat embossing. I wanted the dimension with glossy finish. The sequins are from Build a Scene Christmas collections. Check out Taylored Expression gallery on Thursday for more card from me using this stamp set and coordinating dies. I have listed all the supplies to make these cards below for you. Taylored Expressions is celebrating Release Week with some fabulous giveaways! Visit the TE Blog to answer Taylor’s Question of the Day for a chance to win a prize from the latest release! Also the TE Blog has links to other designers. Check them out for more inspirations. All your creations are super gorgeous Gayatri! 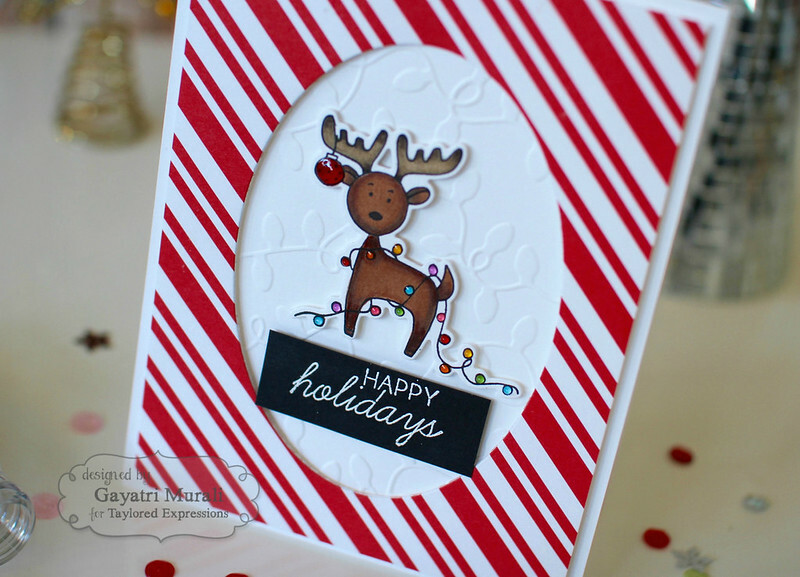 I'm getting really excited about this holiday release over at Taylored Expressions..so many things that I'd like to add to my stash! What an amazing array of cards Gayatri. Love your cards. So fun and festive. I need that lights in embossing folder!